Heerema Fabrication Group (HFG) strives to meet and exceed our client's expectations, and to attain the ultimate objective of an accident-free workplace. Continual improvement of the Quality, Safety, Health, and Environmental performance is of prime importance to Heerema Fabrication Group. Good QSHE performance is recognized as an indicator of the effective overall management of the company. It is, with this in mind, that an integrated Management System has been put in place to cover the combined activities of Quality, Safety, Health and Environment in accordance with legal, industry and HFG standards. HFG hold multi-site accreditation to ISO9001, OHSAS18001, ISO14001, EN1090-1 and ISO3834-2. 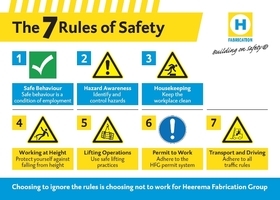 Heerema Fabrication Group is committed to a safe and accident free working environment. In support of this commitment, we have implemented the 7 Rules of Safety. These rules are applicable to all our employees, subcontractors and visitors and address the risks associated with our business activities. These rules are created based on industry best practice and will strengthen our safety culture and eliminate high-potential incidents. Our goal is to create a safe and healthy working environment for our employees, subcontractors and clients on our sites. By regularly assessing possible health hazards at our workplace we are able to identify and address potential health problems. Formal medical programs are carried out on target groups of HFG personnel to detect any general or occupational health problems, so that appropriate action can be taken at an early stage. We measure the environmental impact created by our activities and set annual targets for the continuous improvement of our environmental performance. 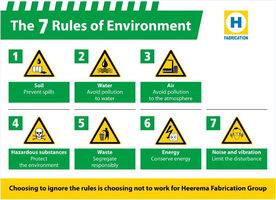 To achieve this, Heerema Fabrication Group developed its 7 Rules of Environment. These rules are the basis for reporting and trending. To ensure that our personnel and facilities are well protected against security threats and to comply with international regulations, HFG has enforced several security measures at our locations. These procedures have been designed to comply with the International Ship and Port Security (ISPS) standard. The Vlissingen and Zwijndrecht locations hold ISPS accreditation. Our customized assessment protocol, CHEQSERT, covers a framework of controls that together drive QSHE performance and the continual improvements of our locations. This methodology has been entirely tailored based on the ‘best practice’ of the offshore industry. 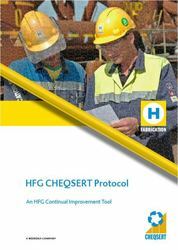 CHEQSERT covers a framework of controls that together with a structured assessment and rating tool, drive our QSHE performance and the continual improvement cycle of HFG’s operations. CHEQSERT audits are carried out yearly in partnership with DNV GL to ensure maintenance of the HFG multi-site accreditation. Through the CHEQSERT protocol, Heerema Fabrication Group is continuously working to achieve delivery of projects in accordance with client's requirements.